Whether it is an employee, manager or director, every school nutrition department has an individual who shows unprecedented dedication to their colleagues and students and goes above and beyond in all that they do. Now is the time to give them the recognition they deserve with the 2019 SNA Awards. How will winners be recognized and rewarded?? Nominees are entered into one of three categories—Employee of the Year, Manager of the Year and Director of the Year. Entrants are recognized on state, regional and national levels. So, besides bragging rights, winners will be recognized at SNA’s 2019 Annual National Conference in St. Louis, Missouri during the Red Carpet Awards Ceremony. National winners will receive a plaque and an all-expenses paid trip to ANC. Employee of the Year—This award recognizes non-managerial school nutrition employees for their contributions. The nominee must be an SNA member in the Employee category and currently hold a certificate in school nutrition or the SNS credential. Manager of the Year—In honor of Louise Sublette, this award recognizes school nutrition managers for their hard work and dedication. The nominee must be a current SNA member in the Manager category working in the school nutrition manager/ head cook/assistant manager field and currently hold a certificate in school nutrition or the SNS credential. 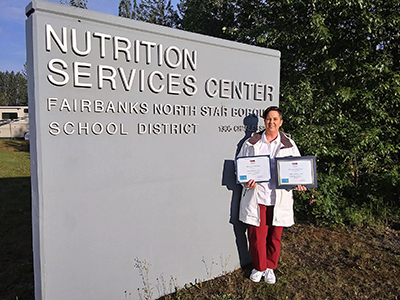 Director of the Year—This award highlights the commitment and dedication of directors in the school nutrition field. Nominees must be currently and for the past five years have served in the position of Director, currently and for the past five years have been an SNA member in the District Director or Major City Director category and hold a certificate in school nutrition or the SNS credential. For further details on who can be nominated, be sure to read the complete rules guide. Each nominee will be judged on four categories—customer service skills, creativity, commitment to professional development and dedication to the school nutrition profession. During the application process, the nominator completes a nomination form and cites examples in each of the four categories. Judging occurs on the state, regional and national levels. Any restrictions on who can nominate? Self-nominations are not accepted. Nominations must be typed, and answers must not exceed the listed word counts. SNA will not accept nominations from current members of the SNA Board of Directors or of SNA national standing or strategic committees. Don’t delay—the deadline is swiftly approaching! Submissions are due online by March 1, 2019; however, the deadline is different for a few select states. (Be sure to check out the exceptions.) For a complete list of rules, entry forms and answers to all of your questions, be sure to check out the SNA Awards website.